The year 2015 has been considered for company profiles in the report. Where information is unavailable for the base year, the prior year has been considered. The report describes and forecasts the global marine fuel injection market on the basis of application, component, HP range, and region. 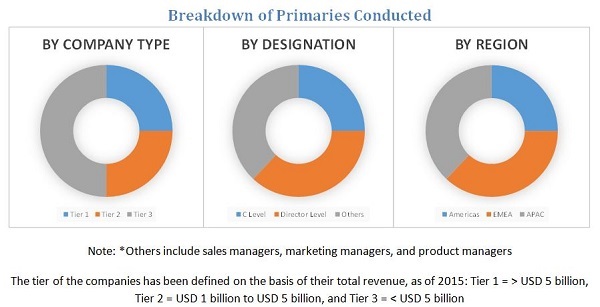 It strategically analyzes the marine fuel injection market with respect to individual growth trends of manufacturers and service providers, their future expansions, and contribution to the market. This research study involves extensive usage of secondary sources, directories, and databases to identify and collect information useful for this technical, market-oriented, and commercial study of the marine fuel injection technology. The flow of the research methodology is explained below. The marine fuel injection market starts with raw material suppliers, which include cast iron, steel, and aluminum & copper suppliers. This is then designed, molded, and assembled by the marine fuel injection manufacturers. The manufactured system in then supplied to the end-users (marine engine manufacturers) through distributors. The marine fuel injection manufacturers include Robert Bosch (U.S.), Rolls-Royce (L’Orange) (U.K.), Woodward (U.S.), and Yanmar (Japan) among others. The end-users include marine engine manufacturers such as Cummins (U.S.), Caterpillar (U.S.), and Rolls-Royce (U.K.). It covers various important aspects of the market. These include analysis of supply chain along with Porter’s five forces model, competitive landscape, market dynamics, market estimates in terms of value, and future trends in the marine fuel injection market. The global marine fuel injection market is expected to reach USD 5.20 Billion by 2021, at a CAGR of 3.9% from 2016 to 2021. The growth is attributed to increase in international seaborne trade, growth of the shipbuilding industry, and stringent marine emission regulations across the globe. Fuel injection system is a collective term used for fuel injector, fuel pump, fuel valves, Electronic Control Unit (ECU), and other components such as fuel rail and fuel pressure regulators. The marine fuel injection is used to attain faster throttle response, better fuel flow, precise control of exhaust system, and equal distribution of fuel. With marine emission norms getting stringent, the demand for new fuel injection systems is also increasing. In addition, the advent of the electronic fuel injection technology is also driving the market for marine fuel injection. The report segments the marine fuel injection market on the basis of its application, power rating (HP range), component, and region. Fuel injector is the only component in marine fuel injection system which is changed frequently, thus it dominated the marine fuel injection market, by component, in 2015. The commercial vessel segment is expected to dominate the marine fuel injection market, by application. The inland waterways segment is also a potential market for marine fuel injection as its demand has increased in Africa, South America, and Europe. Hence, commercial vessel and inland waterways are the key applications to demand marine fuel injection systems. Meanwhile, Asia-Pacific was the leading market for marine fuel injection in 2015, as the region houses several major shipbuilding countries such as China, Japan, South Korea, Malaysia, and India. 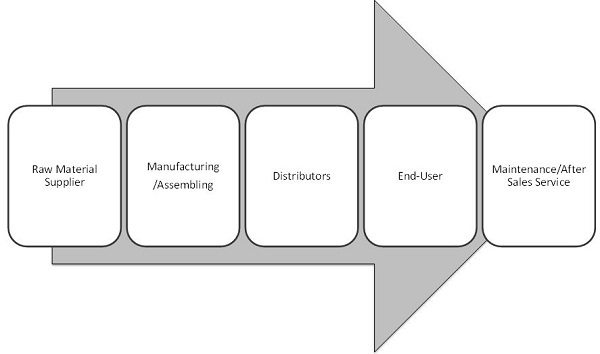 Furthermore, factors favoring this include low labor and manufacturing cost. 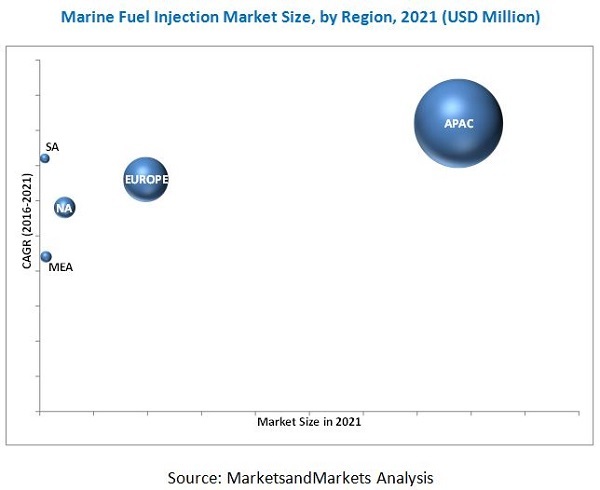 Hence, the Asia-Pacific region dominated the marine fuel injection market in 2015. China is estimated to be the largest market, growing at a decent rate during the forecast period, whereas countries such as South Korea, Japan, Brazil, and India are potential markets to demand marine fuel injection during the same duration. Different regions have different marine environmental regulations for emission of NOx and use of sulfur content in fuel. Hence, marine fuel injection manufacturers would have a challenging task to provide different fuel injection systems for different regions. However, factors such as huge investments required in R&D and high capital required would restraint the marine fuel injection market. Meanwhile, several fuel injection manufacturers are coming up with new technologies, such as methanol fuel injection, in order to cope with stringent environment regulations. Major players in the global marine fuel injection market include Cummins Inc. (U.S.), Liebherr International AG (Switzerland), Robert Bosch GmbH (Germany), Rolls-Royce Holding PLC. (U.K.), Caterpillar Inc. (U.S.), Yanmar Co. Ltd. (Japan), Woodward Inc. (U.S.), and Denso Corporation (Japan), among others. In order to acquire majority of the market share, marine fuel injection manufacturers have invested in developing new technologies.